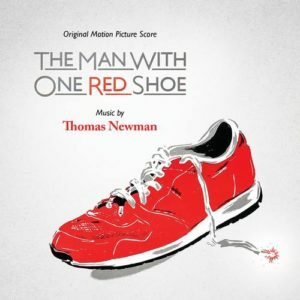 33 years after Tom Hanks starred in the action-comedy The Man With One Red Shoe, La La Land Records finally decided to release the 1985 score by Thomas Newman, or at least some of it. This score has been a “holy grail” for this reviewer since I saw the film for the first time around 1990, and along with a few other scores, it shaped my interest in film music. Director Stan Dragoti (who passed away July 13 this year, age 85) hired then 29-year old Newman to compose the score for The Man With One Red Shoe. At the time, the composer had worked intensely for over a year on several other films like Reckless, Revenge Of The Nerds and Desperately Seeking Susan. Already in september 1984, composer and songwriter Michael Masser wrote a “love theme” for the film. This theme was performed on violin by Hanks in the movie, but it’s unclear if Masser was ever intended to score the whole film. I guess La La Land could have contacted director Dragoti before his passing or producer Victor Drai to get the full story on this, but the sleeve notes do not include any comments from them. A missed opportunity, if you ask me. Masser himself passed away a few years ago. The album features 18 tracks and runs for 36 minutes, so it’s a relatively short effort from La La Land this time around. The 4 minute and 20 second long main title «Strange Beginning» is one of the best main titles ever. It builds and builds, and includes some great guitar work by George Doering and highly amusing voice samples which sound like James Brown on acid. Second track «The Man With One Red Shoe» is cool and jazzy, with finger snaps and Brad Dechter’s alto saxophone. This theme returns in somewhat extended form in «Hapless Hopeful» and «Hover Away». «Umbrellas» and «Maddy» are magically celestial and feature grunting sax, while the jazz elements return in the highly fun «Morocco» and «Don’t Let Carson Go», with trombone and bass guitar. I have seen the film several times, but I cannot recall the «Dream?» cue from the movie, with its ambient synthesizers, performed by Thomas Newman himself on his OB8 Oberheim Polyphonic system. «Pulling Teeth» features fun samples and guitar effects, a catchy synth riff and powerful electronic drums while «The Chase» is a glorious cue, similar to Desperately Seeking Susan. Masser’s «Love Theme» for violin and piano appears as the last track on the disc. Ultimately, there are two glaring omissions to this album. Quite early in the film, during an airport arrival, there is a terrific sequencer-based theme reminiscent of Tangerine Dream, running for 2:20, which is nowhere to be found on the CD. Also, the film’s end credits, clocking in at 4 minutes, features a reprise of the main title plus Newman’s brilliant electronic arrangement of Masser’s love theme. On the disc, only the 2 minute main title reprise called «Second Red Shoe» (remixed by Newman’s current studio engineer Shinnosuke Miyasawa) is included, not the love theme arrangement. According to La La Land, it was Newman’s own choice not to include these cues on the CD, a choice I cannot understand. I think these cues at least could have been included as bonus tracks on a rather short album. So then, it seems like I still have to put on the DVD to hear two of my favorite movie themes ever. Other than that, it’s splendid to finally have The Man With One Red Shoe on an official CD. The album is not available on streaming services like Spotify, but you can buy the CD at La La Land Records.